With our partner the New York State Health Foundation (NYSHealth), ioby is excited to announce the second year of the Healthy Neighborhoods Challenge! Just like last year, the 2017 Challenge is supporting residents across New York state who are taking an active role in creating a culture of health where they live. To read more about how the Healthy Neighborhoods Challenge came to be, check out this blog post from last summer. Donations to the all of this year’s participating campaigns (including the one we’re profiling below) will be matched dollar-for-dollar up to $250 per donation by NYSHealth until May 25. That means your gift will go twice as far to improve public health across New York! 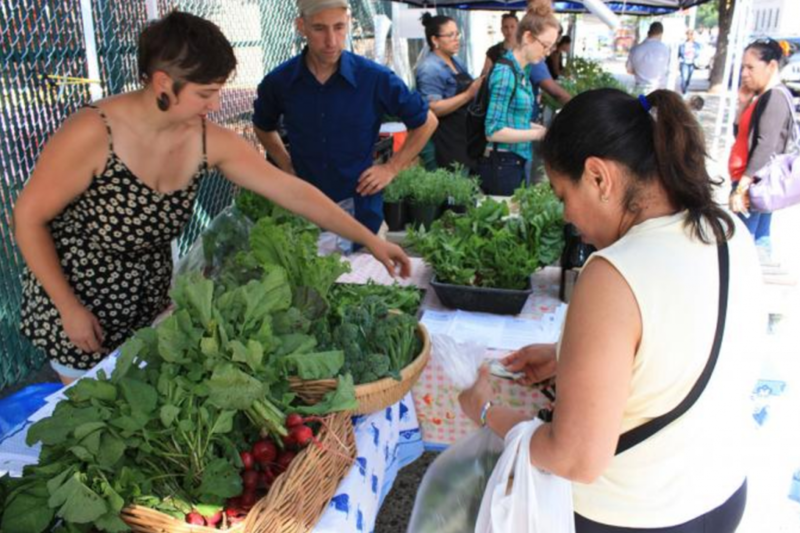 The South Bronx Farmers Market (SBFM), now entering its fourth season, is the only farmers market in the neighborhood of Mott Haven: the poorest congressional district in the country, where almost fifty percent of children live below the poverty line. 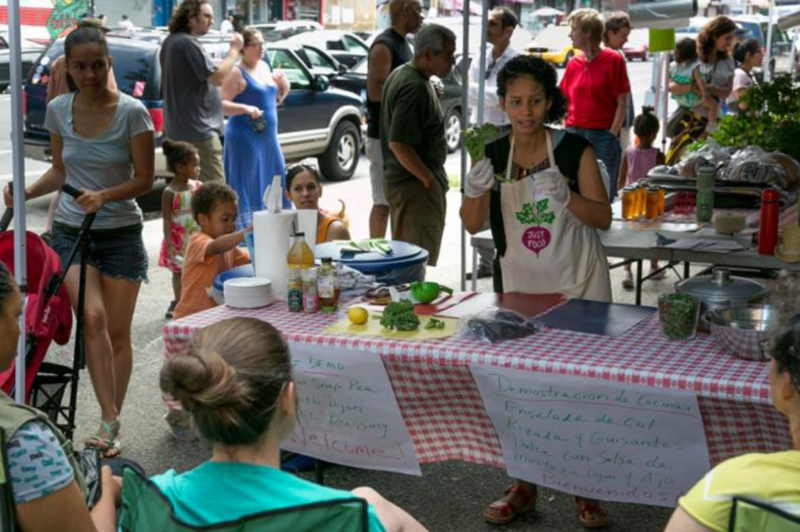 Its founder, Lily Kesselman, and a small team of mostly volunteer staff are on a mission to address the area’s public health crises—in particular obesity, diabetes, and undernourishment—by providing residents better access to nutritious, affordable, locally grown foods, and free, bilingual demonstrations for kids and adults about ways to prepare it. On average, around forty percent of funds spent at the market come through one or more of NYC’s food subsidy programs, including SNAP (Supplemental Nutrition Assistance Program) and WIC (the assistance program for Women, Infants, and Children). Last season, SBFM markets facilitated over $10,000 in SNAP purchases. 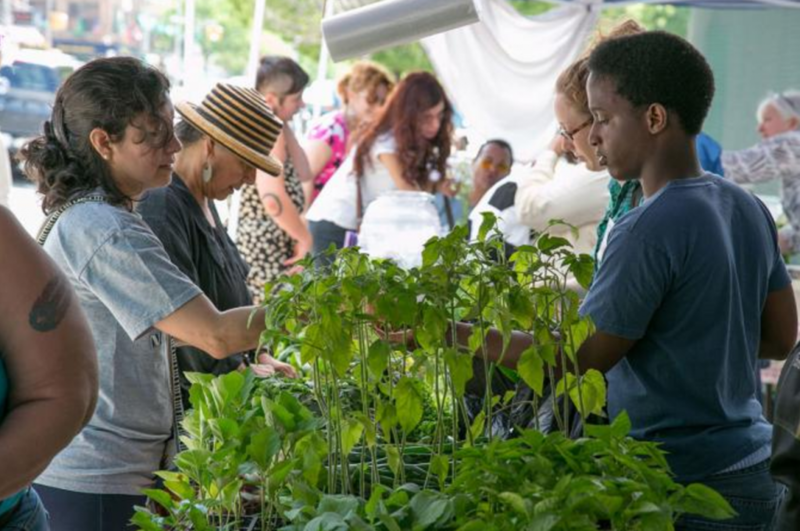 SBFM’s ioby campaign is raising money to extend their hours of operation to include a weekly Wednesday market in addition to the Saturday hours they’re already open. Funds will cover costs like printing flyers, banners, and posters to advertise the new day, as well as living wages for two part-time staffers. Customers—many of whom work on weekends—have requested the extra midweek day, and Jorge and Lily are happy to oblige. Lily relates the story of FreshDirect, which she says recently struck a deal with the city to lease space on state-owned waterfront land in the South Bronx. Their operations will bring a sharp increase in diesel truck traffic through the neighborhood, which already suffers from some of the highest asthma rates in the country. “Our community was notified of this ‘deal’ after the lease was signed and money had been approved,” she says. “FreshDirect aims to push out small brick-and-mortar businesses and will be exempt from any living wage laws in the future. So our tax dollars are pushing out our own small businesses and funding additional pollution that will affect our families. In the future, SBFM would like to expand its value-added offerings (like locally made pickles, baked goods, and crafts), grow to support additional farmers and food companies, and host an indoor market in the winter so residents can access fresh local food year round. 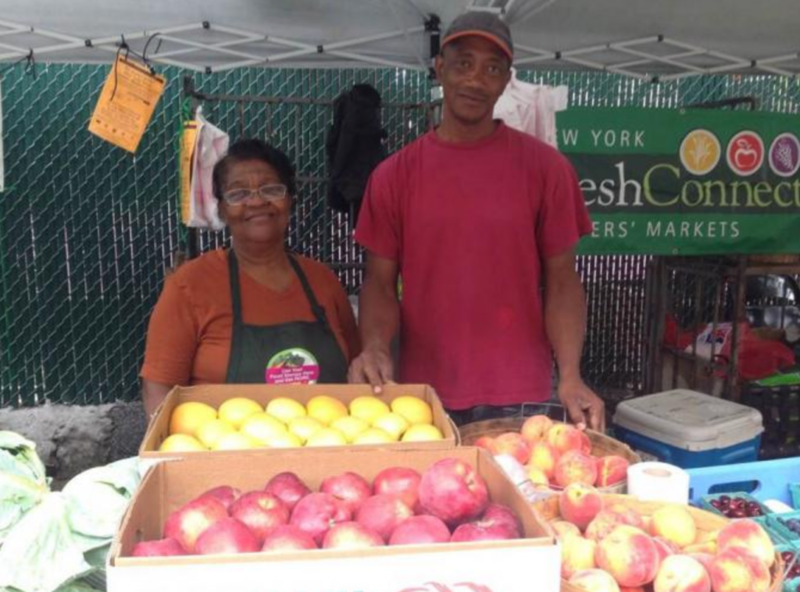 In 2017, the South Bronx Farmers Market will be open Wednesdays and Saturdays from June 17 to November 22, 10:00 am to 4:00 pm. They’re located on the south side of 138th Street, between Willis and Alexander Avenues in Mott Haven, near the 3rd Avenue/138th Street subway station on the 6 train.